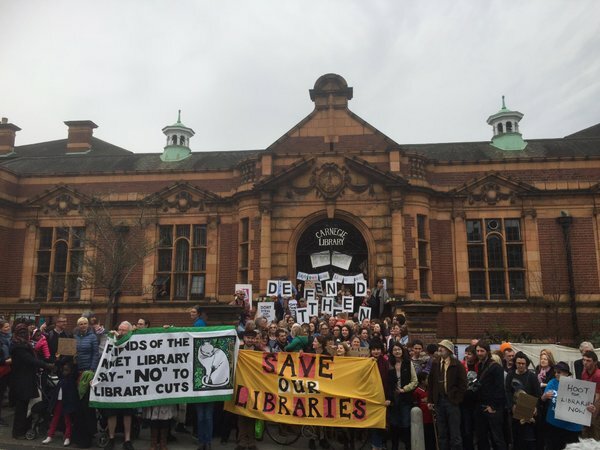 Thank you Friends for fighting for a wonderful library – I lived in Herne Hill for 4 years and was a regular visitor to the library it would be a tragedy to lose it…. I’d be grateful for some reply to a leaflet from Lambeth that came through my door this morning. It points to several ‘myths’ about Carnegie and, in reponse, says that: children will still have access to services and clubs; the gym will be run by Lambeth’s usual operator (so is offered at the normal rates for Lambeth); the library will occupy most of the existing space with a hope that the gym will only be in the currently unoccupied basement; and the building will be staffed. I don’t feel that I know what to believe right now. Are these statements from Lambeth accurate or not? If not, what – precisely – do you know to be different? I absolutely do not want to see Carnegie or any of the libraries go; they are a vital part of our community. But I can that the council needs to find creative ways of actively raising money given that so many of the services across Lambeth have been cut – many of those with potentially devastating consequences for vulnerable people. If I’m going to support any campaign for the libraries I need to believe it recognises that gross expectations for cuts have been placed on all local authorities by the current Chancellor of the Exchequer and that library services are going to be part of the new reckoning. I am no particular fan of Lambeth council so am entirely open to information and guidance on all of this. But is there really no hope of a middle path that you can all take which will allow for some continuation of the library and also for some method of raising new funds along the way? I believe that any asset transfer to GLL or to anyone should require approval from HH residents, because the library is an asset of community value. If Lambeth had consulted prior to the closure, they would have avoided the current situation. They are only making a show of compromise now because of the huge publicity that the occupation has had. Public relations disaster for Lambeth Council. Confusion on confusion, it would seem. It sounds convincing, but many statements need looking at carefully. Children yes of course, but there is an issue with UNACCOMPANIED young people under 16 and the lack of child protection without librarians on duty – the ‘library facility’ will be mainly unstaffed. ‘The building will be staffed’, but by gym receptionists, and visited occasionally by librarians. We are unsure whether there will be enough room for the current clubs to run as no plans have been published and whether clubs which are now free would have to pay fees. The gym would be fee-paying, therefore excluding some people. No rates have been published but may compare with Brixton Rec which is run by GLL. The ‘currently unoccupied basement’ in fact is a wedge-shaped space as the building is on a hill. The usable section houses the toilets and some library offices which serve the whole borough and would be displaced by any gym. The rest of the basement would require extensive building work including underpinning and perhaps removing the current period parquet flooring, at huge expense, disruption and around a year’s temporary closure. The ‘unoccupied section’ cannot be entered without a hard hat for H&S reasons as it is very low but is used for storage. Heard about your occupation and wanted to send solidarity greetings. I worked at Carnegie in the 1980’s. A beautiful building and well used by local readers, including the Trade Unionist Jack Jones, who went on to fight for Pensioner rights. Good luck and best wishes in your fight for libraries open and free. Read piece in Guardian by Toby Litt about occupation to save library…one of many threatened…as a retired Public Librarian of 40 years career I thank you all in this important fight.